Wurtsboro 30KM....Bloody Hell that was hilly. This race was my tune up for Boston Marathon. During the week my legs had been very sluggish so I didn't really know what to expect from this super hilly race. First 5 miles apx are straight up with no break for your lungs and calves. I got in to a nice rhythm and it felt easy up. By nagging those hills for 3 months now I was actually #2 on the hill. Really happy with pace and effort up hill....The next 7 miles was down hill and some flat sections. Really beautiful scenery up state NY. I was trying to keep decent pace sub marathon pace 6:30 ish. No problems. Breathing felt great and legs responded as they should. The down hill looks brutal on paper but it did not feel like it while running (my calves told me differently the day after) Had to stop 2 times to take a leak, not happy with that and one stop to adjust laces. Going in down hill I got a hot spot. So I kind of lost a minute going down.....Before the race they talked about the last 6 miles. Not so much the first hill or is it a Mt? :) And I can tell you the last 6 miles was a killer, rolling hills one after the other...never ending story. When you were done with one hill the next one smashed you right in the face. A little bit like the last 10 miles of Big Sur Marathon...the hills never stopped. At mile 13 my calves started to be a bit sore, but I manged to keep decent pace over the hill. I had to dig deep in the end to keep up with the pace over the hills. Last mile a spectator shouted out that #3 is dying on the hill, I tried to catch him but he put in an extra gear after begin dead on the last hill. Over all very happy with legs and how I ran today! 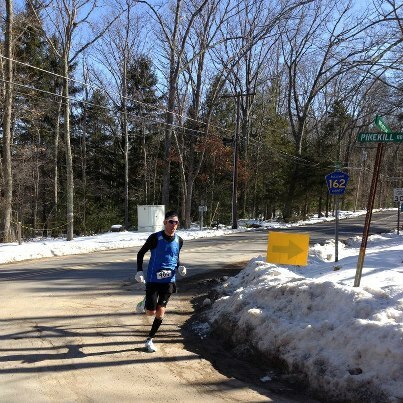 Wurtsboro is a great tune up race for Boston Marathon for sure!